"Chapala Iron fabricated the most beautiful handrail for my home! Not only did it match my existing wrought iron perfectly, it was also built to comply with city building code requirements. The install crew were fast, professional, and I didn't have to worry about them cleaning up their working area before they left. I would definitely recommend Chapala Iron to anyone looking for a handrail." "Cable Art Inc. has been working with Chapala Iron for years now on various projects of all sizes. It is always a pleasure dealing with the staff and the company is prompt with their correspondence and payments. 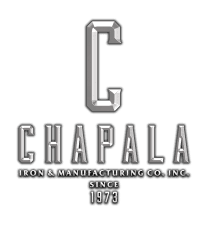 We definitely recommend using Chapala Iron for your Metal Fabrication needs." "Chapala Iron is a 25 year old, privately owned and run Ornamental Iron Manufacturing Company. They provide free estimates and excellent service." "Used Chapala Iron on several small gates, two pairs of large entry gates and several Juliette Balconies in the Summerland area. Chapala met or beat the schedule even when challenged with late changes in design. Chapala was willing and able to offer design and fabrication suggestions to make the elements not only look better but perform better as well. We will definitely use Chapala Iron again. Great team player."